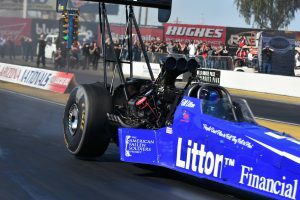 Team Litton Racing recently headed to Wild Horse Pass at Phoenix, Arizona for the Nitro Outlaw Drag Racing Association (NODRA) series kick-off race on St. Patrick’s Day! 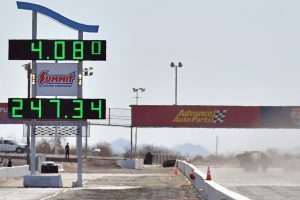 NODRA is a new drag racing association that is “owned by racers for racers” with an emphasis on bringing more fun into the sport of drag racing for the racers AND the fans. 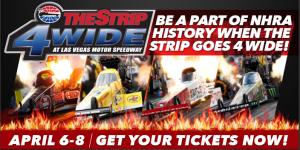 Their mission statement includes a “safety first” approach while implementing a unique format that pays homage to drag racing’s past, all while utilizing new-age social media platforms to get more fans involved in a way not possible before. Instead of a traditional qualifying format, teams are given a single “test and tune” run at the start of the event and drivers then “challenge” an opponent in first round pairings. To add to the tech-savvy fan engagement experience, fans get to choose the lane for each driver via text or website voting. 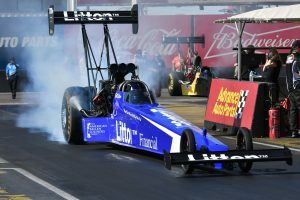 The Worsham-Litton Top Fuel dragster was ready for a day full of nitro and spirited head-to-head competition. Driver Bill Litton, Crew Chief Seth Randall, and crew members Paul, Ray, Duane, Cody, Randy and Glenn got ready for the “test and tune”. They started the weekend off right with a planned 800-foot pass of 4.08 @ 247 mph, making them the fastest and quickest for the round. 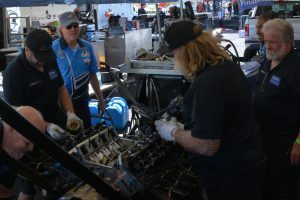 Although impressive, Driver Litton and Team were still hoping to crank it harder and push for the high 3 second range @ over 300 mph. From all of us at Litton Racing, have a Happy Easter! Previous PostNitro Outlaw Drag Racing Video Premiere!